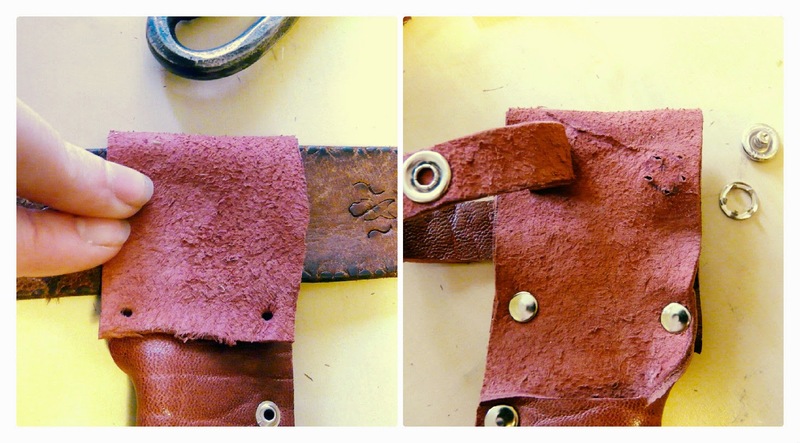 Don't let leather work scare you, it's just sewing with tough materials. Plus hammers. Trust me, it's awesome! I've had this lovely hand forged knife for a few years now, using it for camping and cosplay alike. It's a very functional blade, comfortable in the hand, holding a good sharp edge. I can't say that the sheath has lived up to the blade. Pictured is the second little sleeve I've made, just quick coverings made in a few minutes with a scrap of very thin leather. After a small bit of use the stitched become cut by the blade, and the tip pokes thru. Not a good way to carry it in your pocket! 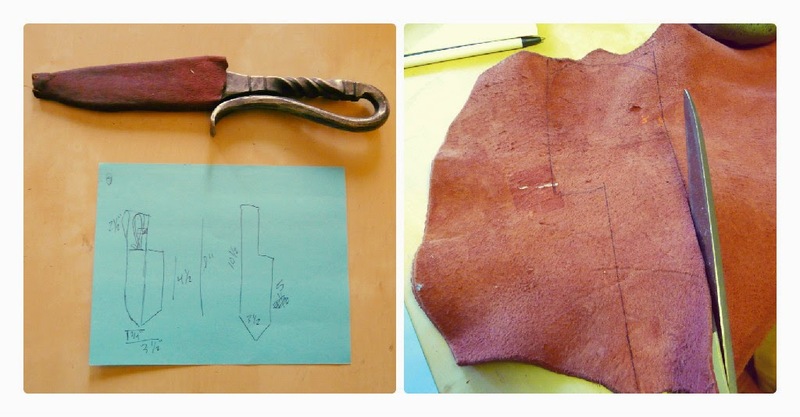 I made some sketches of a simple one piece holster, and then took measurements. The whole item, sheath and belt loop are all one piece. 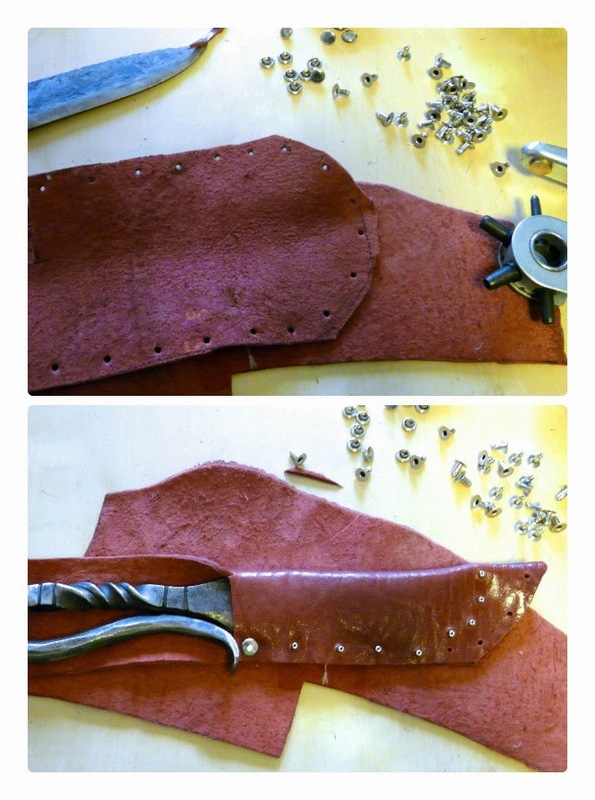 Thus, the cover of the blade is the finished side of the leather, but the loop is sueded side out. I used rivets instead of stitching, to avoid the aforementioned cutting thru problem. The long post rivets let you try the item out before you commit with a whack! I was a bit generous on my measurements, so I brought in the bottom a bit. Notice the old holes near the edge of the leather, I simply cut a new shape after the riveting was done. The belt loop was a simple flip, and I made sure to measure it on the belt and give some room to slide. 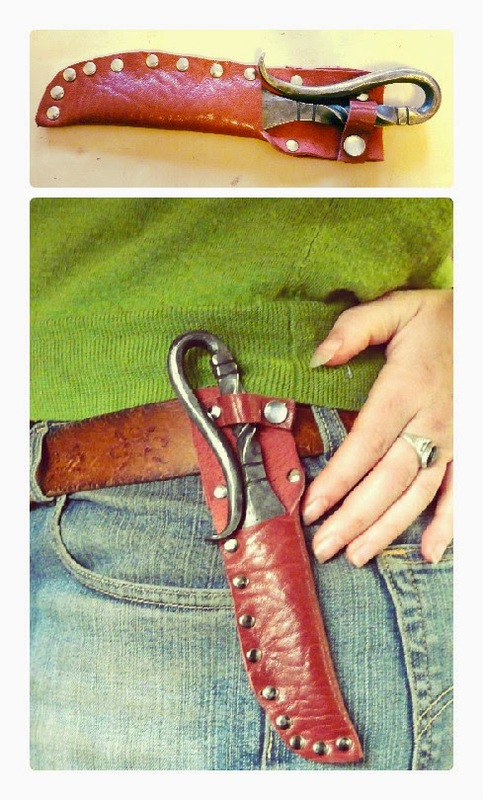 I then attached a little button strap, it loops thru the handle to secure the knife. Those snap sets are tricky to get thru the leather, I made marks with the prong halves and used an awl to poke all the way thru. There was lots of hitting things with a hammer. A good kind of crafting violence! What is your favorite mix of beauty and everyday use? I do love it when crafting and violence can come together in a productive way! Very cool knife! Thanks! I had it forged for me, and now I can wear it I will bring it EVERYWHERE!